Yes, thats right. 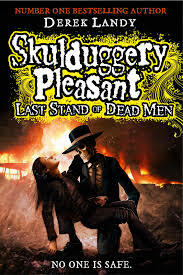 Today is the day so many of us have been waiting for...the release of the eighth in the Skulduggery Pleasant series; The Last Stand of Dead Men. And it's darker, funnier and more exciting than ever before. Anyway, all will be revealed! And you can pick it up NOW! Our manager, Penny is Mad About Books! Rab Fulton is absolutely Mad About Books! Sadie Cramer is definitely Mad About Books! (photo taken by & 'borrowed' from the incredible Conor Hackett... thank you Conor! We are all ludicrously Mad About Books! Today, we marked the end of Dubray Books Summer Readathon with a bit of a party. This was combined with our in-shop launch of our brand new guide to children's books....Mad About Books 2. First, we presented our super summer readers with their certificates and prizes. Gavin Ford (also age 7). 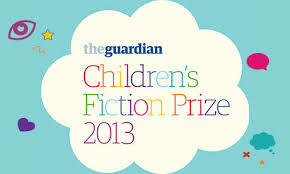 A big congratulations to all the readers ... you guys were absolutely great!!!! To further the celebratory atmosphere, we were joined by Rab Fulton, who regaled the readathon readers, Dubray Books staff and the many, many people who popped in to join in the fun with brilliant, funny and somewhat scary stories... and all on his birthday! Thanks Rab, and happy, happy birthday. Also joining in and bringing her time talent and utter joy for books was Sadie Cramer. Sadie helped present certificates and prizes. Then turning her attention to her artistic talent, she the children making the elements of a wonderful banner that will hang in the children's section! Also, they made I.D. badges that will forever identity them as super readers! Thank you, Sadie! I couldn't have done it without any of you...thanks for the brilliant time; you've made my summer! 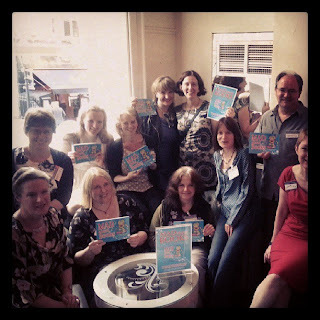 Mad About Books 2: the Dubray Books Guide to Children's Books! After months of waiting, it's out now! 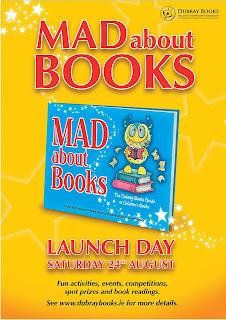 Mad About Books (the second edition) is being launched this Thursday evening, with every Dubray Books Shop holding a special Launch Day on Saturday, 24th August! There will be activities of all sorts... and in Galway, we are also celebrating our Super Summer Readathon Readers on the day as well. Beginning at 12 noon, we will be giving the Super-Readers their certificates and prizes, with activities, goodies, storytelling...all because kids love reading, and we are absolutely sure you will love our new guide to children's books, Mad About Books! I am so proud of this publication. Inside it's covers you'll find over 400 reviews of books suitable for children and young adults of all ages and interests, written by our children's booksellers, along with author interviews and special advice for children's book clubs . We've all worked very hard to bring you the best of the best and for €2, it's a steal! I also need to express my personal appreciation to all of those involved. 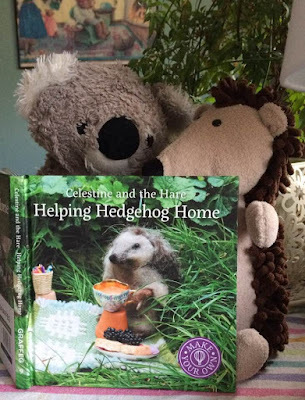 First, there's ex-Dubray children's bookseller and children's book enthusiast extraordinaire, Kim Harte, who started the wheels turning on this project over a year ago. On the back of her diligent work, an amazing publication dream became real. Then there's all of my wonderful colleagues; those brilliant children's booksellers whose opinions and advice are always spot on! Our editor, and of course contributor, the amazing Sarah Webb applied her trademark energy, enthusiasm and expertise. Sarah is, without a doubt, the hardest working author I have ever personally known. You ask her for something... she gives it without hesitation. Thank you so much for everything, Sarah. And a big thank you to the ever-patient, ever-organised Adrian White.And thank you to the owners/management of Dubray in general, for continuing to believe and support your children's booksellers.The thank yous could go on for pages on this blog... this is just the tip of the iceberg! 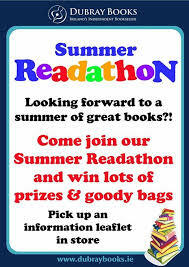 And, as I mentioned, on Saturday, we'll also be celebrating our Super-Summer Readathon Readers... so if you're out and about in Galway (or your local Dubray Books wherever you are) stop in and join the celebration! A fantastically huge congratulations goes out to Elaina O'Neill, who has been announced as CBI's new director! 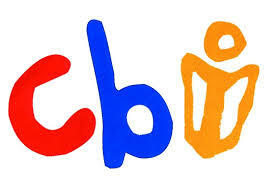 Elaina is joining CBI in mid-September, taking over the position from the brilliant Mags Walsh. Elaina is currently the Managing Editor of Little Island Publishers a.d has proved herself to be an incredible advocate for children's literature. She is currently Vice-President of IBBY (International Board on Books for Young People) Ireland, a member of the organising committee of the Dublin Book Festival and Publishing Ireland International Marketing Committee. And, if that isn't enough, she is also a volunteer Fighting Words (centre for creative writing) and a reviewer for Inis Magazine. Busy, busy lady... Elaina, you've just become even busier! Welcome, Elaina. It will be a privilege to work with you. All the best wishes. The brilliant longlist for this year's coveted Guardians Childrens Fiction Prize has been weighed, measured, and slimmed down to the final four. And it looks like a battle between the US and the UK, with 2 exceptional contenders in each camp! 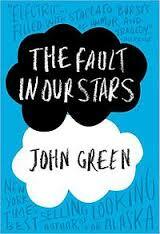 First, we have John Green, listed for the outstanding The Fault In Our Stars. 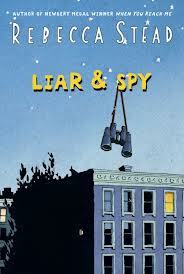 And along with John, another of my favourite writers from the States; Rebecca Stead has been listed for her third wonderful children's novel; Liar & Spy. 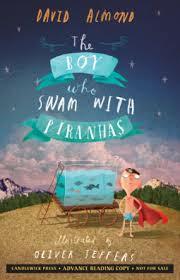 Then in the UK camp, we find a really strong, much-loved and incredible author; David Almond has been shortlisted for the amazing The Boy Who Swam With Piranhas. 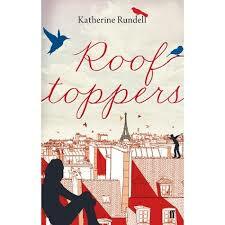 And last, be most assuredly not least; Katherine Rundell has made the grade with her second novel, Rooftoppers. We wait breathlessly for the announcement, of course. But in the meantime, I'm going to read them all again! 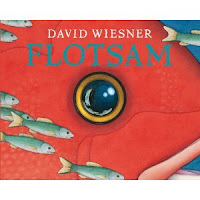 Great Summer Reads...part four: PICTURE BOOKS! This particular post puts me in great danger of going on for hours. I am a huge fan of picture books. I happen to believe that we push our young children away from picture books and into 'chapter books' far too early, or at least that we expect them to leave picture books behind in favour of 'proper reading' at too young an age. You are never too old for a really good picture book. So, I'll try to be concise, if possible. So it was off to the bookshelf to find a few of my favourites for the summer months. It needs no introduction. It needs no explanation. This is a lifelong favourite and is one I think should be read over and over again. This book has everything; love, loyalty, facing your fears, being who you really are, having a great adventure, dreaming big dreams and coming home 'where someone loved him best of all.' Where the Wild Things Are is a book for life. An inquisitive and intelligent boy is at the seaside to collect and examine flotsam; those things washed up on the shore...old toys, driftwood, sea glass... anything and everything. He wants to see what they really are, learn their secrets and stories. Quite unexpectedly, he finds an old underwater camera washed up in the seaweed with an intriguing story of it's own. 'Told' completely in pictures, this is one of the most unique and beautiful picture books I've ever found. Perfect for us all to ponder during lazy summer months. One day, a black dog finds it's way to the home of the Hope family, frightening first Mr. Hope, the all the rest of the family in turn. 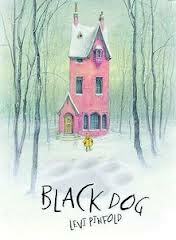 As each member sees the black dog, their fear causes it to grow and grow. Everyone is terrified and doesn't what to do. Everyone, that is, except for the youngest, Small Hope... she knows exactly what to do. Winner of this year's Kate Greenaway Medal, this book is just wonderful. 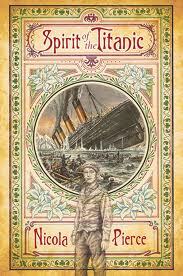 Exquisitely drawn with a beautiful story line, one for the whole family. You just might learn something! Here's one from my own childhood. (See, I told you picture books are life-long reads.) A Little House was built out in the countryside. She was small and well-built and stong and she was much loved by her owners. But time moves on and families grow and move away and the city encroaches. She finds herself alone and neglected in the centre of the urban sprawl, falling into great disrepair....until one day...... a stunning, warm and wonderful story. 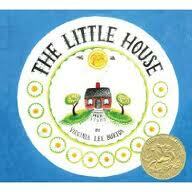 The Little House is now 70 years old! (I am NOT 70 years old.) Also, check out Mike Mulligan and his Steam Shovel by the same author. When Duncan opens his crayon box, wanting to colour, he finds no crayons... only letters, all of which say the same thing; "We quit!". 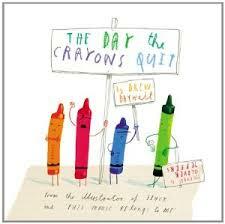 The crayons are all at odds with each other (well, not green... green has no complaints.) and are refusing to colour anymore. Whatever will Duncan do? Great story with exceptionally wonderful illustrations by the one and only Mr. Jeffers. This is a keeper! 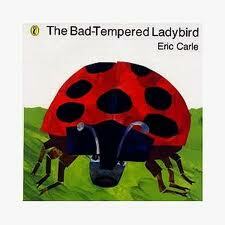 A very cross, bad-tempered ladybird picks fights and starts arguments with every animal he meets. But soon, he discovers the importance of friendship and being kind and turns into a much nicer, much happier ladybird. Not only does this book show the meaning of friendship, it it demonstrates the movement of the sun across the sky and the passage of time. Another great classic from the author of The Very Hungry Caterpillar. 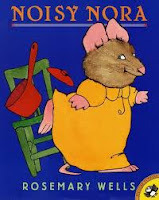 A wonderful story for the smallest of children and the entire family. As the vile and villainous Highway Rat rides the countryside stealing everyone's food, life is not safe for the other animals. They are starving; they are terrorised... whatever will they do? 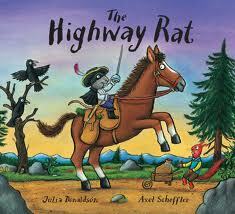 But justice comes for the Highway Rat in the form of a very clever duck. From one of the best-loved author/illustrator teams in the business, we have a rollicking tale based on the classic Alfred Noyes poem 'The Highwayman.' One for everyone to read, memorise and enjoy time and again. Does this sound familiar? It's lunchtime, but one little girl is simply too busy to eat. Besides... she's not really hungry. Along come a crocodile, a bear and a wolf who are starving! Don't worry... they don't eat children. Children taste disgusting! But they are more than happy to help her finish her lunch. 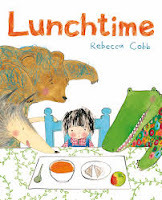 Beautifully illustrated story about fun, friendship and eating your food! Love it! Another real classic from my bookshelf... and an absolute favourite of my children when they were young. Nora is the middle child, and big sister Kate and baby brother Jack get all their parents attention. How can she get some time from her parents? MAKE LOTS OF NOISE! When that still doesn't work, Nora crashes out the door... and things get very, very quiet. It's only then that the family realise that a Noisy Nora is far better than no Nora at all. The joyous final page completes the story to perfection and all is well in the family once again! Rhyme, rhythm and Wells' fabulous illustration style make this one of the best stories for family sharing. Everyone wants a road trip during the summer months, and this one is brilliant. 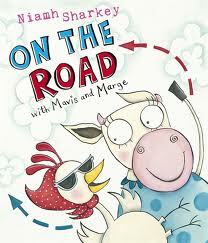 Mavis and Marge are certainly not like the other animals in the farmyard. They have dreams, they have ambitions, they want to go travelling. So off they go! They go over the hills, they cross the sea... they even go to the moon. But suddenly, home seems so very far away and it's the very place they really want to be. From the author that gave us the Hugglewugs... thoroughly enjoyable. 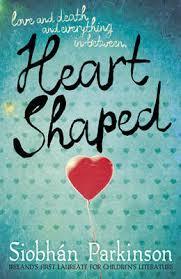 A fun and fabulous read! Okay... there's 10 for you to consider. As I said, I'm in great danger of going on and on and on... so I'll leave it there for the moment. Rest assured, there are many more. Which picture books do you read over the summer months? I am so proud! 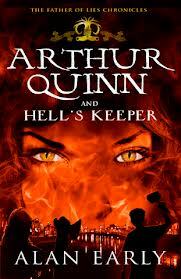 My review of Arthur Quinn and Hell's Keeper by Alan Early is up on The Bookbag NOW! This is the third and final in The Father of Lies Chronicles. And it's the best one yet. Pulling together all the adventure, all the drama in the previous books, this last installment answers the question that has been plaguing me from the very beginning... why Arthur Quinn? What is it about this kid that has made him the target of all of Loki's wrath? And why is it all up to Arthur to save the world... to stop Ragnarok, the ultimate end promised by Loki? You won't see it coming! This one sees Arthur whisked away to Asgard and then plummeted back into a world in which he has never existed..... brilliant stuff! Here's the link for The Bookbag review and of course, it's printed in it's entirety on the Irish Authors... page of this blog! Enjoy! And here's the link for the Arthur Quinn website... everything you need to know! Well, August is upon us now, and we've just a month left before we start thinking about busier days. With back to school thoughts looming large, don't forget to relax a bit more; celebrate those great summer days a bit longer... and don't forget to read whatever you want! I thought I'd add some my favourite Irish published and authored (?) books to the list. Again, some are old, some are new, but all are great summer reads. Alan has lived all of his life in Dublin. But this summer, he and his family have moved to the country...which doesn't seem very promising to him. And when he discovers that his next door neighbors are two little, very old ladies, his mood is not much improved. When Lily and Esme start calling him Albert and Alan discovers a locked room on the top floor of his house and the story of a young boy who died tragically, he begins to worry. But Alan is determined to solve this mystery. With new friend Lisa (a young girl who lives nearby) baking him up, Alan discovers a true story of a summer many, many years ago and gives two little old ladies their most heart-felt dream. A wonderful story of friendship and loss is woven around inter-generational relationship. First published in 1991, this book still reads as warm, funny and thought-provoking. One to keep and read over and over. Madgie Cappock, a.k.a. 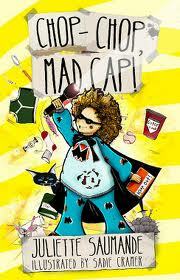 Mad Cap, is a chocolate eating tomboy with a brilliant idea....she opens her own detective agency, Rent-A-Hero and is soon dragging her faithful friend Norbert Soup along while solving a spate of mysteries; a missing butcher, secret passages....even her brother's secret girlfriend! But things don't always go quite to plan. Hilarious misadventures of a destined-to-be-favourite super-hero! The book is peppered throughout with lively, evocative illustrations by Sadie Cramer. Fab....just fab! Grace and her four very best friends are failed witches. 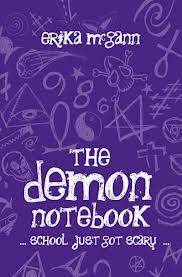 They have a notebook full of rubbish spells that don't work no matter how hard they try. But one night, they accidentally-on-purpose unlock a portal into another realm, and the notebook develops ideas of it's own. The spells begin to work, one after another and Grace and co. have to take control and stop that last one from happening.... before someone gets hurt. But do the girls have enough witchy skill and courage to prevent a tragedy? In the second; during summer holidays, the girls are being trained to be real witches. They are keen to take on some practical magic and work with real spells.... but their tutors have other ideas. Instead, they spend their summer steeped in books and studying weeds. But as school starts, a new, glamorous, exciting teacher appears and wants to teach them the real use of magic. Of course, this leads to arguments among the teachers. The girls find themselves trying to fix the conflict magically, but end up bouncing back and forth in time.... the magic is out of control again! What fun and funny reads with real drama! I really hope Erika will continue this series. What more is there to say.... Teenage criminal mastermind Artemis Fowl has a missing father, a mother in a nervous breakdown and a vast family fortune to preserve. So what will he do? Of course, he begins by kidnapping a fairy. And that makes him Public Enemy Number One. And that's only the beginning. Eight books...all fantastic!